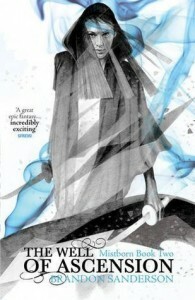 I enjoyed the first Mistborn book despite thinking it had some weaknesses in some areas. I think “The Final Empire” could have worked well as a standalone since there did seem to be enough material there for a traditional fantasy trilogy so I was interested in seeing where the plot was going to in the sequel. There have been plenty of fantasy books featuring the attempted overthrow of a dark lord or evil empire, but it’s a lot rarer (although not unheard of) to have a book exploring what happens after the good guys have achieved their victory. Judging from this book it might sometimes appear that overthrowing an empire that had lasted for a thousand years was the easy part and in the second book the hard work of trying rebuild the world is beginning. As the book begins the previous book’s heroes are in control of the old empire’s capital but find themselves surrounded on all sides by enemies, both remnant of the old regime and new forces rising up to try to take advantage of the power vacuum. Most of the characters are feeling increasingly out of their depth and a lot of the character development in this book focuses on those characters trying to live up to their new responsibilities. At first glance it isn’t as obviously compelling a storyline as the first book’s plot but it does manage to bring in a number of interesting elements, particularly once it becomes clear that there is a greater threat than the rival armies marching on the capital. The nature of this threat is initially mysterious with one of the main plotlines following the scholar Sazeed as he tries to decipher ancient texts detailing this threat. This part of the plotline is the subtlest and cleverest part of the story, as it gradually becomes clear that there’s much more going on that initially meets the eye. There are some interesting plot twists which I thought were very effective (although I wonder if a more attentive reader might have seen them coming earlier). Some of the other plotlines do have some interesting mysteries and plot developments as well and there are also some good action scenes (even if some of the allomancy-powered fight scenes do start to feel a little bit repetitive after a while). I thought the characterisation had some weaknesses in the first book, where the main characters were interesting but the supporting characters tended to feel either simplistic or bland. I would say a similar thing about the second book, there are some good characters and Vin continues to be an interesting protagonist but some of the characters still feel a bit lacking in depth. Elend, who finds himself as the new ruler, does get a reasonable amount of characterisation as he tried to develop into the leader his people need him to be but I still don’t find to be all that interesting a character and although the book does seem to be trying to make him more interesting I still think he’s lacking a little bit in terms of depth and the growing romance between him and Vin doesn’t feel entirely convincing. I think probably my favourite bit of characterisation in the book involved the initially antagonistic but increasingly respectful interactions between Vin and her kandra (a shapechanging being fanatically loyal to its master but also resentful of having to be a servant). I’d probably say the first book in the series was better than the second, although the second is still an entertaining read which adds some interesting new elements to the story. I am interested in seeing how the series concludes, although I wouldn’t say I’m desperate to read the conclusion immediately.